As I have previously shared, I attended college at Duke University in Durham, North Carolina in 1971. Having grown up in the North, I had not experienced firsthand the open hostility of Whites toward Blacks in the South after the Civil Rights Movement. However that changed in the second semester of my first year, when I enrolled in a course on poetry. The course was taught by a White young woman, a graduate student, not much older than those of us in the class. And she was from Alabama, the significance of which will become apparent. The year was 1972. Dr. Martin Luther King, Jr., had been assassinated in Memphis only four years earlier. Civil unrest was present in many predominantly black communities. A year earlier in 1971, former King aide, Jesse Jackson had started Operation PUSH (People United to Save Humanity), an organization dedicated to continuing the unfinished work of Dr. King. In 1972 Barbara Jordan and Andrew Young became the first African Americans elected to Congress from the South since 1898. Shirley Chisholm, an African American Congresswoman from New York, announced she was running for President, the first African American to do so. Schools throughout the country, North and South, were being ordered to desegregate through mandatory busing. And Whites in the Old South, while clinging to their plantation and Confederate legacy, were resisting the change that was being called for at seemingly every turn. The course I took that semester was an overview of English poetry beginning with Geoffrey Chaucer in the 15th century all the way up to 20th century poets like Robert Frost, T.S. Eliot and W.B. Yeats. The culminating project of the course was to research and write a paper on a poet of our choice, and to make a class presentation related to our paper. For my paper I chose the “bard of Harlem,” Langston Hughes. 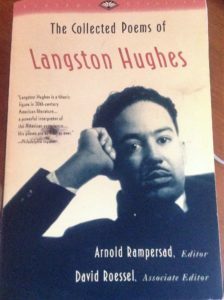 I don’t recall why I chose Langston Hughes, but I suspect it had something to do with my curiosity about the experience of African Americans in the U.S., and Hughes certainly fit the bill. 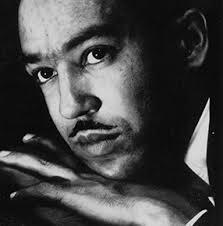 Langston Hughes was born in Joplin, Missouri in 1902 and spent his childhood in various communities throughout the Midwest. He began writing poetry while in high school in Cleveland, Ohio from which he graduated in 1920. He applied and was accepted at Columbia University, but only stayed there a year because of the of the overt prejudice of other students and teachers. However, while at Columbia Hughes must have wandered down the hill to Harlem where he encountered the vibrant cultural life of the African-American community. And while Hughes travel widely, even going to Russia and serving as correspondent in the Spanish Civil War, he always came back to Harlem. He eventually earned his B.A. degree at Lincoln University, an historically black college in Chester County, Pennsylvania. He then embarked on a career of writing travel logs, novels, essays, plays, and poetry. When I gave my presentation to the class, I read a few poems like this one, and as I read, had students snap their fingers to the beat, to get the feel. What I did not appreciate at the time was how poems like this for Hughes were not only descriptions of the what happened in a jazz club but also were testaments to the resilience of African- Americans, in a segregated oppressive society. 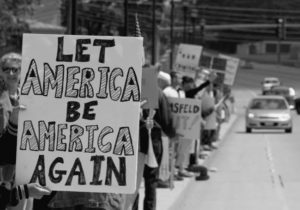 But perhaps one of his most enduring poems and most poignant is “Let America Be America Again” in which Hughes, like Frederick Douglass, James Baldwin and others, shines a light on the lie that is the American myth. Despite my disappointment with the grade, I intuitively realized that my instructor’s reaction to my paper was the kind of slight and prejudice that persons of color experienced every day at my school and throughout the country. While I was angry at the grade, it was more of an “aha” moment into the very discrimination Langston Hughes wrote about so elegantly, and the resistance to that discrimination he celebrated. I never forgot Langston Hughes because of that poetry class, though I quickly gave up my idea of pursuing an English major; if this was the kind of professors I would have to deal with, I wanted none of it. I moved on to other things and more or less left Hughes and his poetry behind. However, many years later, I began reading the poetry of Langston Hughes again. The combination of life experience and a growing awareness of the influence of White Supremacy in all of American life has given me a deeper appreciation for his poetry and his life. In a sense it wasn’t just the words of poetry Langston Hughes that shaped me and impacted my life, it was also the reaction of my grad student- instructor. In spite of herself, my instructor helped me realize how prophetic, radical and needed the words of Langston Hughes were in 1972 and still are today.